"This impeccably researched, lyrically told historical about a brash American woman and her French husband during WWII is a remarkable achievement.... Benjamin (The Aviator’s Wife) skillfully weaves in a host of historical figures—including Coco Chanel, alleged to be a Nazi sympathizer, and Ernest Hemingway—whose vibrant presences make Benjamin’s protagonists and engaging group of supporting characters shine all the more. Even readers who aren’t big fans of historical fiction might be swayed by this outstanding tale." "Benjamin, who has made a career out of fashioning compulsively readable historical fiction starring real-life women..., does it again here.... The novel improbably but effectively combines a delectable, upstairs-downstairs look at the operation of a luxury hotel; a many-textured and deeply romantic love story; and a compelling drama of the French Resistance.... Readers of Kristin Hannah's The Nightingale are the natural audience for this book club-ready historical novel." "A compelling portrait of a marriage and a nation at war from within. At the glittering height of the twenties and thirties, suave French manager Claude Auzello has turned the Ritz hotel into the jewel of Paris, installing his brash American wife Blanche as queen among the movie stars, fashion icons, and crowned heads that make up the hotel guests. But the Auzello marriage is rocked by infidelity and turmoil even as the Nazi shadow rises in Germany, and when the Ritz becomes Third Reich headquarters in occupied Paris, France's ultimate power couple must decide if they can weather the storm together or crumble under the oppression and brutality of war. High fashion, royal gossip, political scheming, and French Resistance sabotage all swirl together to make Mistress of the Ritz a cocktail as irresistible as anything served at the Ritz bar!" "No one writes of the complexities of women’s lives and loves like Melanie Benjamin. In Mistress of the Ritz, Benjamin brings wartime Paris brilliantly to life and brings home the terrible dilemmas and moral conundrums forced upon occupied citizens during the war. Blanche Auzello is a martini-soaked flapper with a heart of steel. Benjamin’s fascinating story brings this forgotten heroine vividly to life without flinching from the high price paid by those who fought back against the Nazi scourge. Intense, illuminating, and ultimately inspiring!" 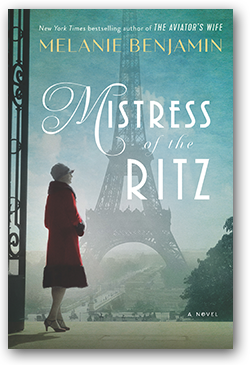 "In Mistress of the Ritz, Melanie Benjamin illuminates the little-known story of Blanche Auzello, the fiery American who, along with her French husband, secretly worked for the French resistance while hosting senior German officials at their storied hotel. This meticulously researched and richly told story could only have been penned by Melanie Benjamin—already an icon of historical fiction, she has truly outdone herself. Important and inspiring!"